Due to flight problems we arrived in Maroantsetra late afternoon with no local currency and minus my suitcase. Monique, the hotel owner, was amazing! She took me shopping to buy some clothes and essentials - with only 30 minutes shopping time she insisted that the stores would not overcharge me, because we were tourists. Monique changed some Euros into Ariary and also gave me a hairbrush and swimming costume (for use at Masoala Forest Lodge, our next destination). Monique helped to ease an otherwise, distressing situation which made the start of our holiday so much better. I can't praise Monique enough and it's this type of care and service for customers that makes this lodge stand out from all others. The staff are well trained - very friendly and helpful. The lodge is excellent with very comfortable lodges in beautiful landscaped gardens - do take a walk along the beach at sunrise and see the locals fishing. The food is excellent, especially the Madagascar king prawns. A very enjoyable stay and highly recommended. It's a perfect base for exploring the Masoala penninsular. This could be paradise - pristine white, empty, sand beaches, snorkelling right off the beach with plenty of fish to see, interesting walks in primary and secondary forests and along the beach with easy sightings of lemurs and other wildlife, and kayaking along a dream of a coast. There are no roads so access is by foot taking 2 days or by a one hour open zodiac boat ride from Maroantsetra. It’s a raised tented lodge with patio and a separate bathroom that is accessed from the outside with no mosquito protection (not good if you have to go during the night!). There is hot water in the morning and evening but you can request it to be turned on at other times. Power is available in the evenings and devices are charged in the main reception/dining area (5pm to 9pm). The food is not the best feature here. We understand the difficulty in getting quality food to a remote lodge but we stayed in other equally remote lodges and they provided much better food, more tenderly cooked and well presented. Local villagers provide some services and local food, eg eggs and honey. You can get a phone signal if you stand on the bench on the beach. Generally walks start at 6.30am (to avoid walking in the heat) and the night walks at 6.30pm. There is a lot of wildlife as the area is so remote. South Africans, Chris and Julie are excellent, friendly, helpful managers (the owner is also South African). We highly recommend the kayak trip with Chris along the coast to the hidden cove, sacred island and river – but you do beach the kayak many times so take your waterproof sun cream with you – the sun is fierce so you will need to re-apply it! We stayed for 5 days. Excellent quality, location, ambience, facilities and food (great confit of duck and lamb stew – very tender). Inclusive meals are limited choice but a good range. Friendly staff. 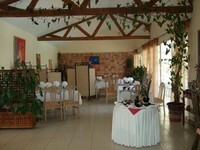 Excellent roomy lodges, with patio. Hot water and power all day (occasional glitches), unlike many of the remote lodges. Swimming pool. Free wifi in the reception – not very fast but it was unexpected! The lodge supports wildlife with its Lemor Island, a refuge for lemors that were previously pets (a practise banned since 2001). The lemors are very tame and jump on your shoulders/arms. You can get some great close up photos. There's a crocodile reserve that also has chameleons, turtles, wild fowl and a small museum - it’s a bit run down. Good hotel, not too far from the airport for early flights. Good restaurant. Happy to provide an early breakfast – but the service was not very quick. Air-conditioning. free wifi in all rooms. Large swimming pool and poolside restaurant. A luxury tented camp under tamarind trees with excellent food and service. The sun rises directly in front of the tents over the Mandrare River giving breathtaking early morning views. At night, far from civilisation, the stars are the best you’ll see anywhere in Africa. The 6 luxury tents have adjoining large well decorated bathroom with quality shampoos, soaps shower gel and mosquito cream. There's permanent hot water and lights from solar panel power. Electronic devices need to be charged at the main house from 5pm to 10pm. The lodge is eco-friendly with trees being planted to attract the birds. All guests dine together. Aperitifs are taken outside the dining tent or on as ‘sun-downers’ in the sisal fields, whilst watching the sunset. Quality wines or other drinks are served at meal times or upon request - all inclusive. The chef provides excellent, near gourmet food which is very well presented. Ed is an excellent host and extremely helpful, as are all the staff. The guides are very informative and have a good sense of humour. Ed has been successful in befriending the local villagers and he is supporting the school children by providing them with satchels, notebooks and pencils. The long drive (3.5 hours) from Port Dauphin is on poor roads – unmaintained tarmac until Amboasary and then dirt tracks through the sisal plantation, however, the trip is well worth it!. Pleasant courtyard rooms that are modern, clean, light and airy. TV, air-conditioning, permanent electricity, which was a great relief after our trip to a remote tented camp! Dinner is taken at the older, La Dolphin, next door (same owners). Free wifi in every room. Beware of the beggars who pester you outside during the day. A once very elegant old Victorian manor, restored with a lovely lounge and garden sitting area. Excellent room and bathroom, with free wifi in every room. Beautiful décor. Very friendly and helpful staff – nothing was too much trouble. We stayed overnight and had an early departure at 5.15am and we were provided a light breakfast in the room. I wish we could have stayed longer to enjoy it more. They don’t do an evening meal so a member of staff walked around the corner with us to show us La Bousoul restaurant. An excellent, comprehensive menu. The carpaccio of zebu and the shrimps were excellent but the Zebu fillet was tough so we sent it back and they happily replaced it with another meal and gave us a free dessert and rum drink. Excellent service. Very comfortable, air-conditioned and spacious wooden lodges with lovely wooden floors, a cool concrete bathroom and a patio having excellent views. Power 6pm to 10pm in the lodges. Excellent dining room, lounge area and terrace overlooking beautiful gardens with the hills in the background. Excellent menu and quality food. In the middle of nowhere, very basic spacious concrete semi detached lodges with staff who are willing to please. Power in the lodges from 6pm to 10pm. Good food considering the remoteness of the hotel and the facilities available. Tsarabanjina is a 2 hour boat ride (40 nautical miles) from Nosy Be but the trip is well worth it. The welcome couldn’t be warmer as visitors are greeted by the staff waving on the shore. The 21 individual lodges are fairly standard but with luxury toiletries, power and hot water 24 hours. They are set into the trees, some with hammocks, overlooking their own beach frontage of white sand and turquoise blue sea, with your own deckchairs, umbrella and table, which is set up every morning. There are a lot of sandflies but they do spray the beach daily and you are provided with coconut oil for protection (we didn’t use it as we sat in the shade on our terrace mostly). There are many activities - kayaks, catamarans, water skiing, snorkelling, scuba diving, hand-line and deep sea fishing, and walks around the island. The snorkelling is excellent and there is a daily trip with a biologist off this or the other islands in the archipelago, which makes it very interesting. There are lots of birds including the Madagascar sea eagles and reef herons. The staff are the most helpful and friendly you'll ever meet. The island is very unique and pristine. In 1992 it was the location for Girl Friday, a BBC TV programme and book by Joanna Lumley and you can see the book in the bar (it’s worth a read whilst you’re there). The hotel and lodges were built in 1994. Falling to sleep every night with the sound of the waves crashing on the sand was bliss. (I wish I could return soon).